As night fell, astronomer Jean Jacques d’Ortous de Mairan watched a plant’s leaves, symmetrically arranged side-by-side on a stem, clamp shut. It was 1729, and he was studying the dramatic nocturnal movement of Mimosa pudica. Strangely, he found that the plant behaved the same way even when it wasn’t exposed to natural cycles of light and dark, making his observation the first known example of a circadian rhythm that didn’t depend on external stimuli. Circadian rhythms are biological cycles that repeat daily, matching one full rotation of Earth. After this discovery in a weedy creeper, the planet would rotate tens of thousands more times before scientists studying the daily habits of a household insect exposed the mechanics of the biological clock. This year’s Nobel Prize in Physiology or Medicine was awarded to Jeffrey C. Hall, Michael Rosbash, and Michael W. Young for their studies of the circadian clock in fruit flies. But their discoveries weren’t just insect idiosyncrasies—they held true across much of the living world, from animals to plants and even some bacteria. And, as many researchers building on their work have found, circadian rhythms have immense importance in human health. This story is not an isolated example: it’s the sixth time a Nobel Prize has been awarded for the study of fruit flies. 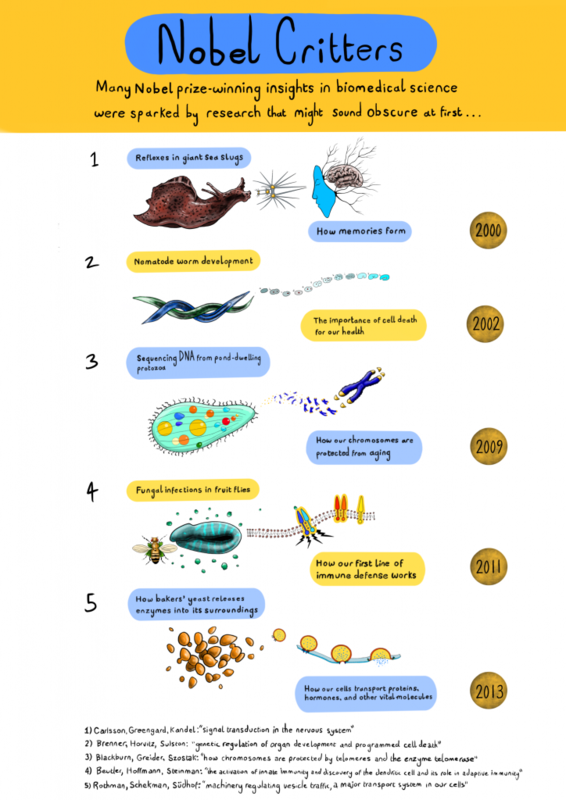 In fact, a surprising number of Nobels—along with the insights and practical outcomes of biological research—have emerged from a few seemingly insignificant species: vermin, creepy-crawlies, and microscopic blobs. Alex Cagan’s artwork below samples just a few recent examples. Sometimes, such research has been ridiculed—notably by politicians looking for examples of wasteful spending. In some ways, this is understandable. Research with clear, immediate applications is the easiest type to justify to the public. But the type of science that instead aims to fill gaps in our understanding of the world—known as “basic” or “foundational” research—doesn’t focus on specific applications, like a disease cure or a drought-resistant crop, so no one can predict the real-world impact of any individual line of inquiry. However, understanding the world we live in and the creatures we share it with has proven an essential fuel for technological, agricultural, and medical advances. The most well-studied species on the planet are called model organisms, creatures chosen for intensive research because they are particularly suited to laboratory studies. Fruit flies, for example, have played a crucial role in unraveling the principles of genetics and evolution. Such fundamental insights can eventually lead to human health and other applications, but not in a predictable way. For instance, in the late 1970s, scientists undertook an epic hunt for genes that affect the development of fruit fly larvae. This work uncovered several important biological pathways that govern how simple eggs transform into complex animals and earned Eric Wieschaus and Christiane Nüsslein-Volhard the Nobel Prize. Among the genes discovered was Hedgehog, named for the spiky embryos that result when it is mutated. Related genes were identified in mammals, and decades of work eventually revealed their connections to cancer and other diseases. Since 2012, two drugs that specifically inhibit tumor growth by targeting the Hedgehog pathway have been approved by the FDA to treat basal cell carcinoma, giving patients with advanced cases of this type of skin cancer a better chance of survival. Yet Wieschaus and Nüsslein-Volhard hadn’t set out to cure a disease—they were simply trying to understand how life works. Different model organisms cater to different scientific needs. For example, mice and rats are mammals, like humans, which means we share much of our biology. The stripy zebrafish has a transparent embryo that allows scientists to watch development happen in real time. The nematode worm Caenorhabditis elegans can be rapidly grown in dishes, and because its cell divisions can be individually tracked through a precisely defined ballet, it’s another good choice for studying development. The mustard cress Arabidopsis thaliana is a fast-growing weed with a tiny genome that is much easier to study than the massive genomes of key crops like wheat and corn. Without knowing why scientists choose particular species, model organism research can appear frivolous—and some creatures scientists choose to study may even seem disgusting. Take, for example, the dung gnat Sciara coprophila. Studies on this poop-loving insect revealed the phenomenon of genomic imprinting, in which genes are turned on or off depending on whether they were inherited from the father or the mother. As it turns out, imprinting exists in humans—and has important consequences. For example, there is a stretch of chromosome 15 that is turned off in the copy inherited from the mother but turned on in the paternal copy. If the paternal copy of chromosome 15 is missing or has a mutation in the imprinted region, the result is Prader-Willi syndrome. This serious disease is characterized by cognitive disabilities and constant hunger, often leading to obesity and type 2 diabetes. Another nearby region of the chromosome shows the opposite pattern: the maternal genes are normally activated while the paternal ones are turned off. Individuals missing the maternal copy of these genes have Angelman syndrome, which causes developmental delays, seizures, and frequent smiling and laughing. Insights from model organisms have long helped scientists understand the biology behind such genetic diseases, but in recent years model organism researchers have become even more directly involved in diagnosing the millions of people affected—and in searching for treatments. Some model organisms differ even more from us than insects do. For example, humans and the yeast cells we use to make bread and beer last shared a common ancestor a billion years ago. Yet brewer’s yeast, Saccharomyces cerevisiae, is one of the most thoroughly studied organisms on the planet. These single-celled microbes share many characteristics with human cells, but they can be rapidly grown in great numbers in a flask or petri dish, and they have a life cycle and genome that make their genetics easier to study. Several Nobel Prizes have been awarded for research on yeast, including the 2016 Nobel Prize for Medicine or Physiology, awarded to Yoshimori Ohsumi. The prize was for his work on autophagy, a kind of cellular housekeeping that helps clear the cell of damaged proteins and other potentially toxic debris. The role of this recycling and disposal system in human disease was not appreciated until Ohsumi and his colleagues’ work in the 1990s revealed the yeast genes that orchestrate the process. Thanks to the knowledge and tools made possible by this basic research, studies of autophagy in animals have exploded since the 2000s, revealing its complex roles in embryonic development, cell starvation, infection defense, neurodegenerative disease, and cancer. The road from a discovery to its impact on society is rarely straight. Few of the scientists in these stories could have predicted how their work might one day be applied. Every day in labs across the country, scientists start down new paths that could eventually lead to the next cancer drug or technique for controlling disease-carrying pests. But it will only be possible to follow these new paths if we, as a society, continue to support the pursuit of knowledge—with or without clear applications. This post was co-authored by Nicole Haloupek and Cristy Gelling based on an article we wrote for the March for Science blog. The text has been revised and updated to include the 2017 Nobel Prize in Physiology or Medicine.